Milburn Taylor, a native Texan from the Dallas/Fort Worth area, is an advertising design graduate of the Art Center College of Design in Los Angeles, California (now in Pasadena, California), and the University of North Texas in Denton, Texas. Milburn held a variety of creative positions at nationally recognized advertising agencies and design studios before starting Milburn Taylor Associates/Creative Services in Fort Worth, Texas (1978). 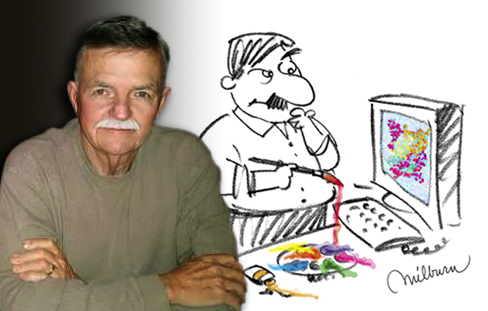 In 1981 Milburn moved his family and aspirations to Austin, Texas where he opened Milburn Creative offering Advertising/Graphic Design Services. Clients have included local and regional advertising agencies, public relation firms, banks, real estate companies, chambers of commerce, and small business owners, as well as national and international companies. Milburn always looks for natural solutions—then he adds a creative twist to make the results more memorable and effective. Growing up in the family upholstery business, Milburn learned to appreciate the struggles of small, mom and pop businesses, and has a special place in his heart for them. On the other end of the spectrum, Milburn has consulted with, and created advertising design for multi-million dollar international corporations. Regardless of the size of the business, Milburn’s design work is always very personalized and this helps clients build strong personal relationships with their clients and customers. Early in his career Milburn developed unique skills to help business owners, public relation professionals, and marketing directors “think through” their projects. At times a client may only want an “outsider” to listen to their story or marketing ideas to help them make more informed decisions. As a creative consultant Milburn is always ready to listen and help. Milburn and his wife, Ruth, a Marketing Professor, at Texas State University, have had the privilege of traveling throughout the United States, Canada, China, Japan, Mexico, England, Sweden, much of Europe, Morocco, Costa Rica, Peru, Ecuador, Guatemala, and most recently Oaxaca, Mexico. These travels have helped him gain a unique perspective, and it shows in his work. 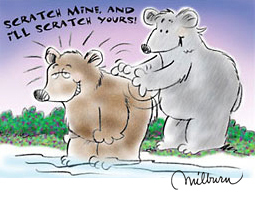 Milburn is a member of the National Cartoonist’s Society, and a founding member of the National Cartoonists Society/Texas Chapter—formed in November 2014. 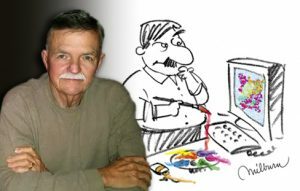 He also designed the Texas Cartoonists logo and website. 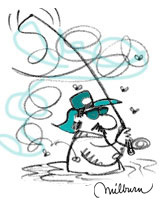 Milburn is an avid “wannabe” fly fisherman, and after 10+ years, is still an absolute novice. But he loves the sport anyway!